Microsoft Corporation is working with the NASA to build a system which will allow the scientists to work on Mars project remotely from anywhere in the world. So far the scientists had a limited option to work on the red planet. But the new windows OnSight will make the process a lot easier for them. The scientists will know all about the Rover’s moves and not only that, they can also discuss the progress with fellow scientists working on the same project. This will be done via a wearable device and it will create a 3d simulation. This is a major breakthrough by Microsoft Corporation; it will help all the scientists to know all about the happenings in Mars project. Rather than guessing and searching on the internet they will get all the information directly. Fred Calef, in his video conference pointed out an interesting fact about this wearable device, that is if someone wears it for long time then the person will feel like they are on Mars, not in the place they are currently working on. So according to Calef, a JPL Curiosity rover geologist this device can give the closest feeling to teleportation. 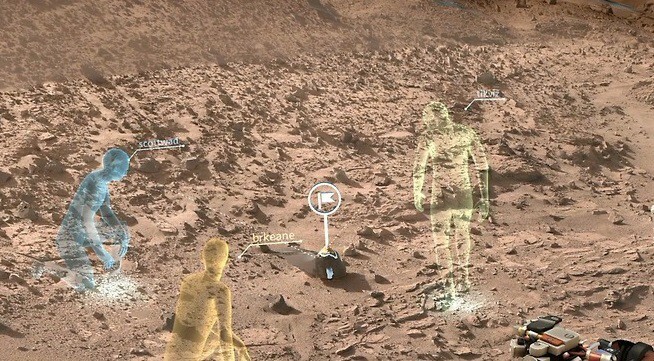 Mars Curiosity mission team will put on the wearable device developed by Microsoft Corporation and with the help of 3D technology they can take a look at the surface of red planet more closely from many different angels. The device is going to change the scientists looked at Mars so far, with all the updates coming their way they will also be able to work more quickly. NASA who wants to send human beings to the red planet by the year 2030 is only moving ahead with this new development. Everyone is now curious about the test results of the device.